Enough talking about them. I need to eat one. For years, the Scotch egg has been used primarily as a foodstuff and a mediocre bludgeoning device. However, it is documented by science that you can also improve your pathetic life by using the Scotch egg in place of these five everyday items. 1. Easter Eggs: As the Holy day grows nearer, children are already dreaming of annihilating the chocolate bunnies hidden in their grassy Easter baskets. In order to spice up the Holy Easter Egg Hunt, fry up a couple dozen Scotch eggs and use them as an environmentally friendly option to the plastic ones. It will be an event the entire neighborhood is sure to remember. As a bonus, you will probably not be asked to organize it again. 2. Cookie Bouquets: For the same price as a three cookie bouquet delivered in a pail and gone within a day, you can make over 30 Scotch eggs. Stick them on wooden skewers and arrange them in buckets. Imagine your loved ones’ surprise when they behold the stark physical beauty of their favorite treat on a stick. 3. Faberge eggs: Instead of flaunting your wealth with a tacky symbol of capitalist wealth, consider putting a Scotch egg on display in your china case. As opposed to a Faberge egg, a well placed Scotch egg highlights the practicality, good taste, and thrift of a home instead of the wasteful excess that disgusts most visitors. 4. Meals: Scotch eggs are a natural powerfood, with each one containing roughly 500 calories. By replacing two meals a day with one Scotch egg (per meal), and eating a head of cabbage for the third you could could lose up to five pounds a week, depending on everything else. Note: this diet is not for those concerned about scurvy or other diseases caused by malnutrition. 5. School Mascots: More than a symbol reminding us of the Brits’ hardened arteries, the humble Scotch egg is also a symbol of bravery and persistence. Some unknown genius sat in a darkened room with her two favorite foods–a hardboiled egg in one hand and a sausage in the other–and knew there had to be a way to unite them. Despite being told it couldn’t be done, she achieved the impossible. Competitors and friends alike will fear the Fighting Scotch Eggs for their tenacity and tendency to achieve miracles. 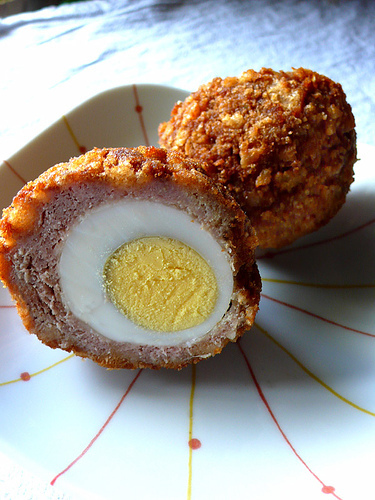 At halftime of every game, the school chefs can roll out a barrel of Scotch eggs onto the playing field. * Scrambling for the treats will ensue, as well as laughter, mirth, joy, and complete happiness. *This idea originated from someone else’s mind vineyard. You know who you are. P.S. A link to a real recipe for Scotch eggs. Despite the apparently brilliant combination of ingredients in the Scotch egg, I have unfortunately never had one that’s left me anything other than instantly constipated. However, I long to this day for the crisp, home-made specimen I saw British chef, Gary Rhodes make on TV one hundred years ago. Haha I’ve yet to actually try one. The images that I’ve come across are not always encouraging, and neither is your statement for that matter, but I feel like i’m obligated to taste one since I’ve talked so much about them now. Emily, you have once again tickled the funny bone on this one. But I have to say that after looking at the recipe, it can’t be as bad healthwise as you make out. I have a market in my neighborhood that has the best sausage, and it is so lean that you actually have to add oil to cook it. And I use extra virgin olive oil, never vegetable oil. And eggs are naturally good anyways. But giving credit to the mind vine is stretching it a little. I would think more along the lines of mind brambles. I suppose you could make a healthy Scotch egg, but then it wouldn’t be as much fun to make fun of. I just thought of a new challenge for myself: making fun of a salad. It shall be done. Just tought you should know – my girl was watching Iron Chef last night, Battle Eggs, and yes, the challenger made a scotch egg. Just want to make sure you get the royalties due you for popularizing this amazing culinary creation. I’ll be in contact with Food Network shortly. Thank you for alerting me. Got to see two Faberge eggs, up close and personal. The Scotsman in me says Scotch eggs are far more useful, although you could sell a Faberge egg and buy bunches of Scotch eggs. Haggis is just a big sausage, but from the parts list I just shy away. Should try it before I die….or maybe I’ll try it and die. Those both seem to be viable options. Do you ever think it doesn’t make sense that even though Faberge eggs are more expensive and have a better reputation than Scotch eggs, they would likely kill you if you ate them? Real and yet simultaneously surreal, while even practical, and practically amusing. I know how to get here, but I never know where I’m going after I show up. This is fun! Just wait until the Easter Egg hunt! I just read through your scotch egg series. Genius as usual! That’s pretty much exactly what I thought. And you reminded me of yet another story about my dad. He once bought a scotch egg from a grocery store in Qatar. It was sold in the refrigerated section and packaged much like how you would a pound of minced beef. (I wasn’t with him at the time, but he pointed it out to me weeks later when we were grocery shopping together. It didn’t look remotely tempting). As I’ve mentioned before, my dad has a thing for trying strange new foods, and on that particular day he was really, really hungry. Perhaps that’s why it seemed like a good idea at the time. Can you imagine what a layered ball of eggs, bread, meat and grease would taste like when it isn’t even freshly made? Needless to say, my dad never bought another one again, and I’ve been indirectly turned off ever since. This series on the other hand? You’ve managed to put those horrendous things under a whole new light…and now I’m actually open to trying one. If I don’t like it I’ll just pitch it to the bro. I’m sure he’ll appreciate it. Right? Yikes. And God knows how long it had been at the grocery store…..probably got there on a barge during 1920s. I was also closed to the idea when I first heard about the Scotch egg, but after blogging about it for 3 days straight and looking at increasingly delicious pictures, I might also be obliged to eat one eventually. And from what I understand, brothers appreciate almost anything tossed at them. Especially food. Scotch eggs . . . A favorite UK pub food. Best eaten when you’re too drunk to know what you’re eating, I would think. One description: “A good Scotch egg, in our opinion, has a lightly fried, flavourful crumbed coating, good-quality pork meat and a runny-yolk egg centre and, ideally, an excellent mayonnaise to dip this delicious snack into.” Is there a little emoticon for “cringe”? I’d rather have felafel or doner kebab any day! When I was your age, I visited a friend in Scotland who wanted me to sample some local cooking. One night we a pheasant (which had been shot in the vicinity) with a nice red wine; another night we had haggis (cringe emoticon?) and scotch whiskey. I’m not sure under what circumstances one normally eats scotch eggs, but I avoided them at her table on that visit and on one subsequent trip to the Border. If you pass through London you should try one . . . Better you than me! After talking about them so much, I feel it’s almost my duty to try them. What kind of blogger would I be if I didn’t? Talking about things I didn’t know anything about—unheard of! I like the idea of a cringe emoticon….just spent trying to come up with something and this is the best thing I got -00-. I think I’ll stick to talking about Scotch eggs. The recipe sounds simple, but when I read “free range eggs” I imagined eggs found lying around on the ground, abandoned by nomadic free-range chickens. I suppose giving those homeless eggs a purpose is an act of mercy. I’m also imagining a nuclear-grade case of heartburn from eating a Scotch egg, but me and sausage never did mix well together. Had Marie Antoinette known of Scotch Eggs she would never have recommended cake for the masses, I’m sure. If only she’d been a little more well travelled, she could have famously been quoted as, “Let them eat Scotch eggs.” And the people would have rejoiced. Also, what egg wouldn’t like to take refuge in the warm wrappings of a sausage blanket. WHAAAAAAAAAAAAT? I think my braingrapes just exploded. The Scotch egg monster is real. How about a series on injustice called Snot Fair? Having read the whole lunch saga, I reckon you could pull it off? Or maybe you have already and I just haven’t got back far enough in your archives. I have not heard of the hard-cure bacon you speak of…I imagined bacon flavored rock candy, which is just sugar crystals on a stick. There we go with the sticks again…perhaps the Snot Fair idea is pretty solid. I’ll give you imagination credits. Proof on the whole corned beef thing. Can’t find pic of the hard cure bacon, but have eaten crubeens )in banner pic) many times. I had goat hoof once in Morocco and it was actually quite tasty—like most things I suspect it just depends on how you prepare it. This is a great website, by the way, full of real information. A complete change from my own. Ah, information is overrated. And most of it is wrong anyway. And children would have all of their dreams come true as they could at last devour their craft supplies. DON’T DO IT. Okay I guess you can. If you look again, I actually did add a real recipe in the very last post, because now I really want to make them. I’ve got the fever, the Scotch egg fever. And I am humbled by the awesomeness of the Scotch Egg. Can’t wait to try this! Have you actually eaten one? No, but I know now that I must. If I’ve eaten chicken fried steak, then there’s nothing holding me back from eating a Scotch egg. I’m surprised you haven’t listed any of the military options for Scotch Eggs. Just imagine 5000 of these falling from the skies instead of bombs. And then a party as everyone realizes how silly their disputes were in comparison with the beauty of the Scotch egg. Brilliant. Number 6) A surprise gift you can leave in a friend’s glove compartment. Or couch. Or bathtub. Anywhere really. It’s hard to go wrong. They look like they could be the perfect substitute for those cake pop things that are so popular now! Just looked up cake pops….and yes, they look delicious. But at the end of the day, they’re not Scotch eggs. It’s time for a revolution. We just brought cupcakes to Emilia’s classroom for her birthday, but next year, 100% Scotch eggs instead! If you can’t convince the kids they should eat healthy, confuse them by telling them they should eat healthy and then giving them Scotch eggs.